Do you know Studio Neat? Well, to me they are a company that likes to attack a wide range of problems that are generally completely unrelated, but awesome nonetheless. Actually, it is hard for me to think of a company that does what they do quite like they do it, and that makes them stand out a bit. This past year they made their way into the stationary world by releasing a product known as the Panobook, which was a cool, thinner than normal spiral notebook that fits nicely when working around a desk keyboard (review here). 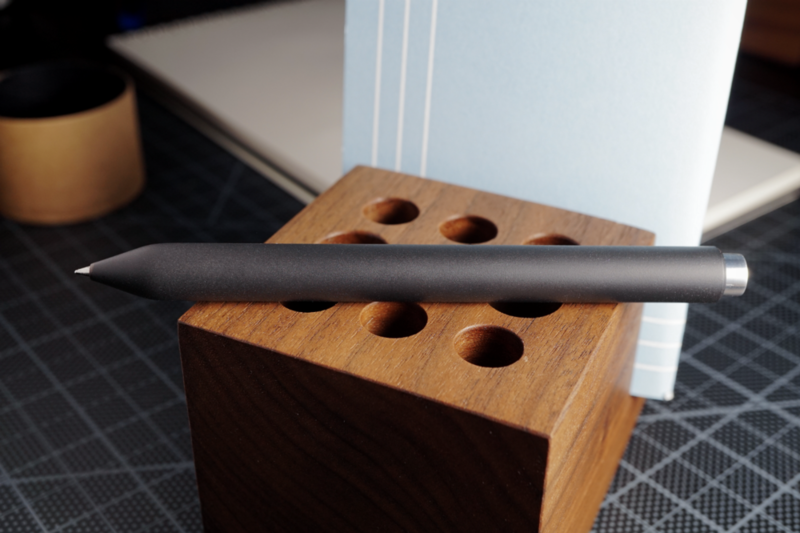 Well, they're back with a new minimal pen called the Mark One and they were kind enough to send me a prototype to check out and review during their Kickstarter campaign. As an overview, the pen is a cylindrical aluminum barrel about 5 inches long, a "clicky" mechanism, and is covered in a Cerakote finish to give it a new form of protection. There are quite a few pens that use DLC, PVD, or anodized coatings, but I think this is the first I've used one that has Cerakote. What is Cerakote? It is a polymer-ceramic coating that gets applied and then baked onto the surface that is highly resistant to abrasion, chemicals... let's just say this is tough stuff and is usually reserved for things like gun parts. In shape, the pen is very simple: no taper or curves in the barrel until you get to the tip, and a slight chamfer at the top near the knock. And, the version they sent is the matte black edition which gives it a uniform, monotone look. Although, the knock is a raw silvery metal (likely aluminum on this one) which provides a stark contrast against the rest of the pen. I enjoy the feel of the Cerakote in hand. It has a soft texture, but tends to also have some grip. And, the coating really doesn't show a lot of fingerprints/oils. For the refill they opted for the highly popular Schmidt P8126, a capless rollerball that lays down great, dark ink flow, and is shorter in length than many rollerball refills which allows for a more compact pen design. For this pen they also machined their own all-metal mechanism, although, the one I have in my pen is different than the version on Kickstart. The guys sent me this one a few months back to check out in anticipation for a slightly earlier launch, but they opted to rework the mechanism a bit to make it a bit more "satisfying". So, this version I'm reviewing is not EXACTLY like their current production model, but I'll explain a bit more as to why I think they made the adjustments. The mechanism is machined from all metal and activates well. This early prototype has more of a "press" (more a squish), rather than a satisfying "click". Although, it works really quite well but I did find that it was a little light and easy to press which did lend to some problems. One thing of note is that the pen is clipless which means it goes right into the pocket. And, with a light mechanism I found that it would extend the tip while in my pocket so I tended to carry it in one of my leather pen sleeves. I can't confirm whether or not the new "click" created some added tension to prevent the unwanted pocket extensions, but I would probably assume it helped some. One additional thing I noticed about the knock mechanism is that it tends to get some wear on the sides, even after short use. This seems common in pens that are metal-on-metal between the knock and barrel, but something to certainly be aware of if it will drive you mad over time. I think the length is really good. It is a rather light pen at 0.7oz, and the 5" length allows it to rest comfortably in the fleshy part of my hand and doesn't come up short. While writing I'll also note that I only experienced very mild tip movement, almost undetectable, something of which I am somewhat extreme in my lack of tolerance of. 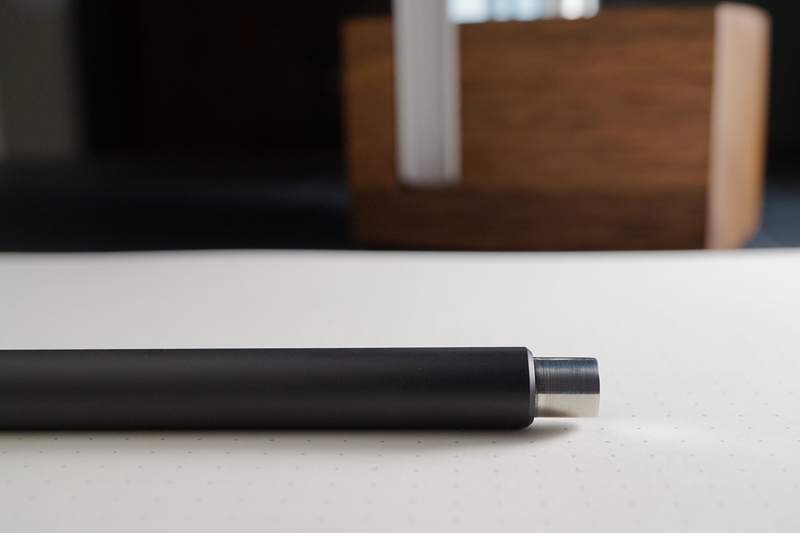 There are pens I've been really excited to buy since their design was great, but the tip movement prevented me from ever enjoying it, so I'm glad they sought to address it in their engineering. The guys have already blown way past their funding goal which is really exciting for them, and, I can confidently say that I think they've created a sound product. The pricepoint on it is $50 during the Kickstarter campaign which I think is super reasonable. Definitely check this one out and thanks again to Studio Neat for sending the prototype to check out!